Each kit contains 4 chrome plated retaining clips, 4 chrome plated cups, 4 springs, 4 rubber seals, and 4 steel washers. Sportster 1957-1985 and Panhead 1948-1965 (2-3/8” long clips). Replaces OEM #'s 6762B, 17947-36, 17945-36B, 17950-48. All Shovelhead, Evolution, and 1940-1947 Knucklehead (3-5/16” long clips). Replaces old OEM #'s - 146-36, 140-36, 138-36, and 142-40. Replaces new OEM #'s - 6762B, 17947-36, 17945-36, 17949-40, and 17950-66. 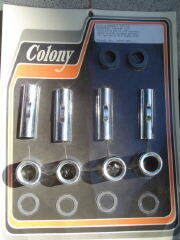 Colony Stock # 7507-20 & 7508-20.